New arrival! Product Description: Hot sale! A lovely gift for any special day. The wholesale product of vacuum-packed cultured pearl oysters is highly praised and appreciated by the consuming public. The list price is for 30PCS of Mix 20 Colors Single and Twins Individual Package 6-8mm Saltwater Round Akoya Pearl Oyster. If you purchase this listing, you can get 20 colors: white, pink, lavender, dyed black, dyed red, blue, grey, gold, bright purple, dark green, hot pink, yellow, light green, chocolate, rose, salmon, baby blue, champagne, copper, light purple and some twins by random color. The oysters with the cultured pearls of bright luster in special packing way are very suitable for your family, friends, lovers, or even yourself as a gift. We have reliable quality and reputation. Pick this hot selling product and you won't be disappointed. Each cultured pearl oyster was packed in a individual vacuum bag. Shipment: UPS Delivery time: 3-5 working days. 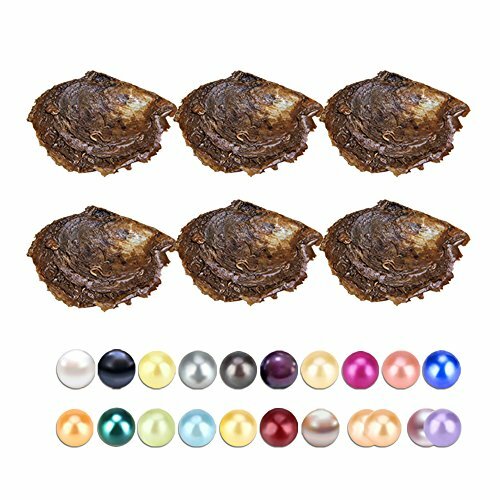 The list price is for 30PCS of Mix 20 Colors Single and Twins Individual Package 6-8mm Saltwater Round Akoya Pearl Oyster.